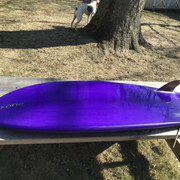 Wound up getting a fish shaped by Bob Pitagno/exotic surfboards! He was awesome to work with and design the board. Had a ton of different templates. Settled on a Mike tabling template he had and drew the tail in a bit ala a Machado go fish. 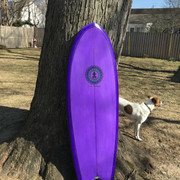 Glass on wood keels and a bitchen purple color! He says to hit him up if you’re in the market, fishes are one of his favorites to make! Now to see how it goes!! Too bad you picked it up AFTER this mornings session! I can't wait to see it in person. As far as the Monmouth County NJ shapers... I know people with Mencel fish (and mini simmons) and they love them. Can't go wrong with Rozbern either. Google Josh Kerr ripping on one of his fish. GUNN is making me a fish this spring, he's in the Asbury area. Look for GUNN on instagram! Page created in 0.536 seconds with 48 queries.